There are some days when nothing tastes good. Like when you are sick – as I have been this last couple of weeks. Then, there are days when everything you eat just tastes amazing! 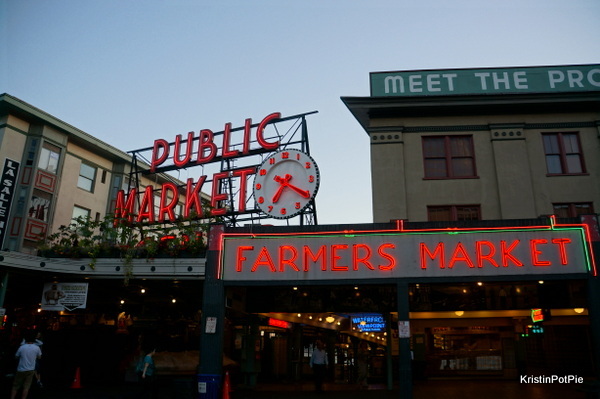 That’s what happened when I attended this summer’s Sunset Supper at the the Pike Place Market last month. 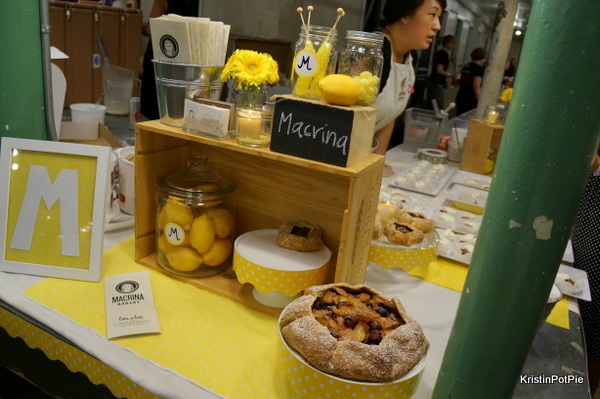 I know it’s been a few weeks, but I would be remiss if I didn’t share with you my favorites bites (and sips) that I enjoyed at this wonderful event. I happened to be hanging out with a pescatarian that evening, and joyfully for her there was plenty in the way of seafood. 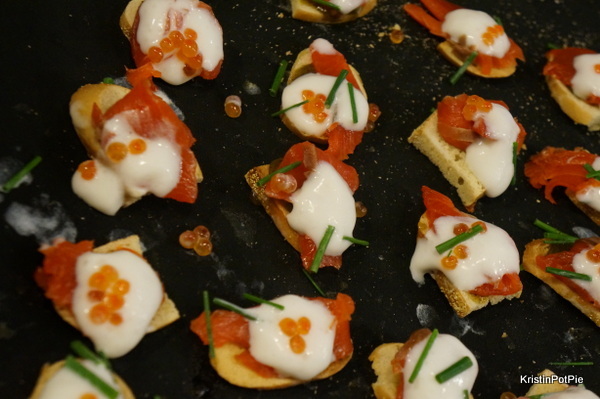 One of my favorite tastes of the night was this house smoked salmon with buttermilk, chives, jalapeno and steelhead row on a bagel chip from Manhattan restaurant. 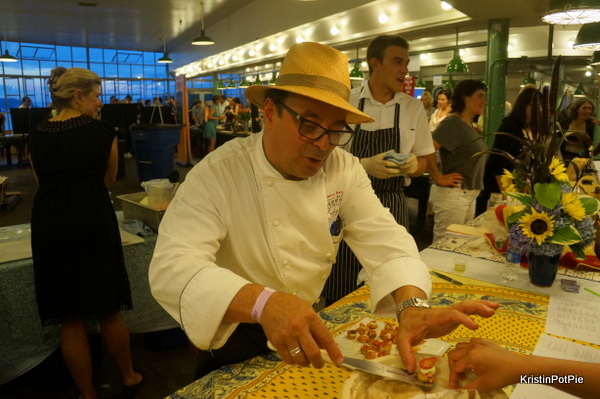 Chef Thierry Rautureau was there representing his downtown Seattle Loulay Kitchen and Bar. 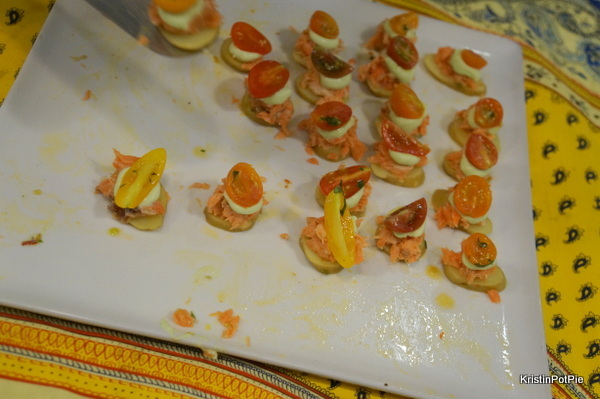 The Chef in Hat served up some lovely smoked salmon with fingerling potato, citrus creme fraiche, cherry tomato and basil. 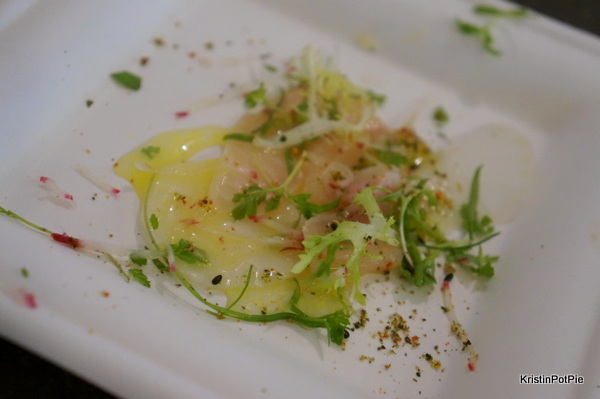 At the City Catering Company booth there was a savory hamachi crudo with sea beans, french breakfast radish, togarashi powder and yuzu oil. What a gorgeous dish! 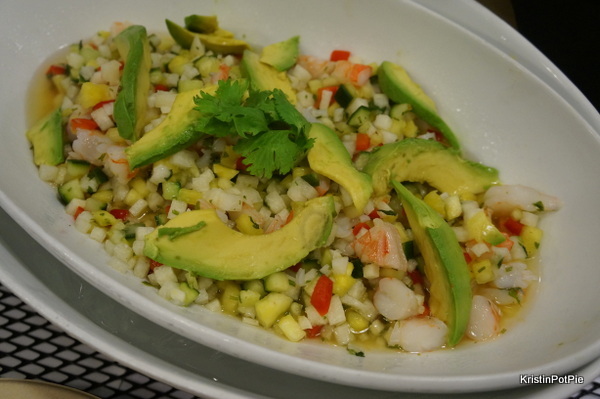 And Flying Fish featured shrimp ceviche with pineapple, jicama, mango, avocado and cilantro. After several seafood tastes, this meat eater was in the mood for something more to sink my teeth into and this event did not disappoint! These grilled beef short ribs from Chan Seattle called to me and momentarily satisfied my craving for (RED) meat! 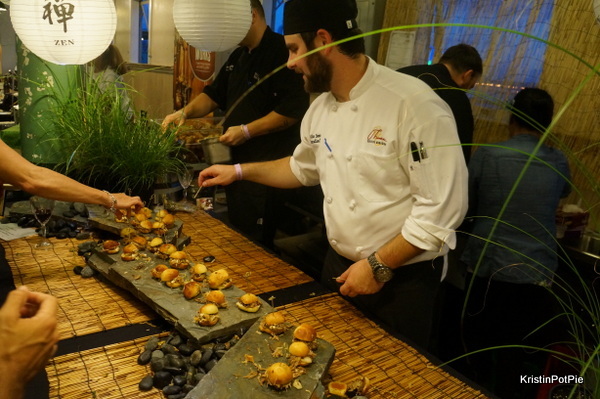 Then it was on to this Asian duck confit on a homemade brioche roll with spicy aioli, homemade kimchi and micro greens from Thomas Cuisine Management. 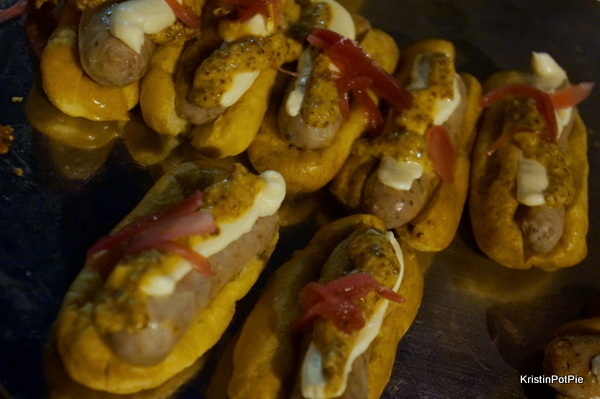 Kaspars Special Events & Catering was grilling up some enticing looking coiled sausages. I am not one to pass up sausage of any type! I was delighted with this grilled lamb and potato sausage with curry cabbage slaw. The rabbit bratwurst with stone fruit mustard and house kraut was tasty indeed. 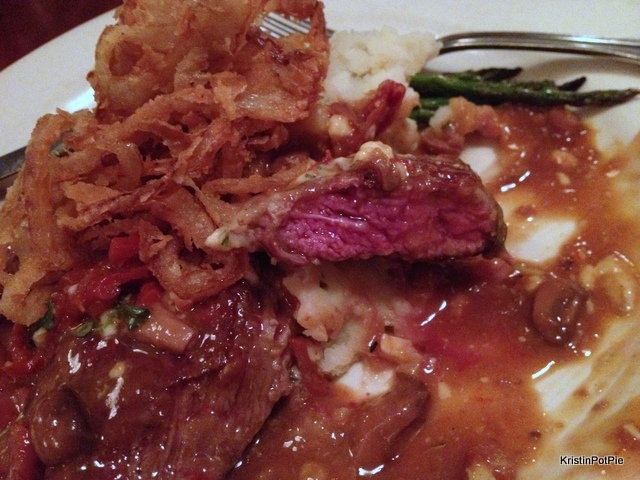 I do love dessert, but my preference tends towards the savory side. 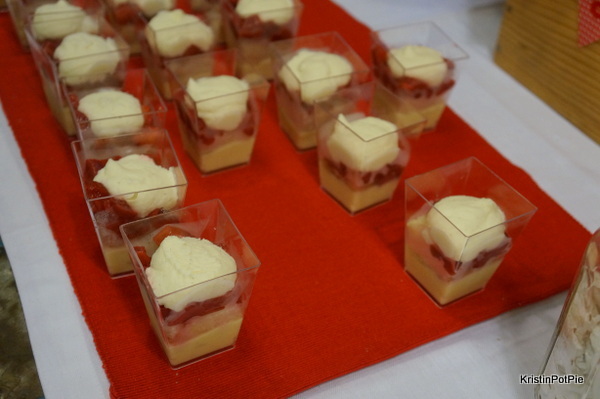 I was thrilled with the nice selection of not-too-sweet-desserts. 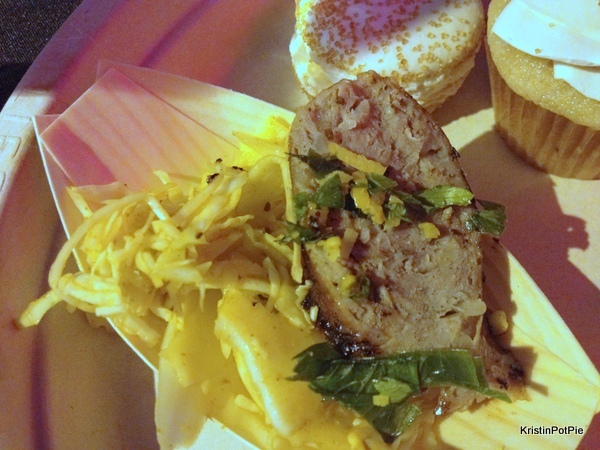 Such as this breakfast complete in a mini cupcake from Yellow Leaf Cupcakes. 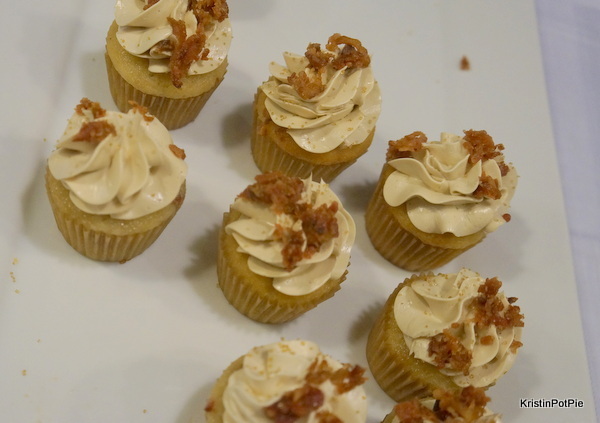 Pancake cupcake with maple frosting topped with crumbled bacon. 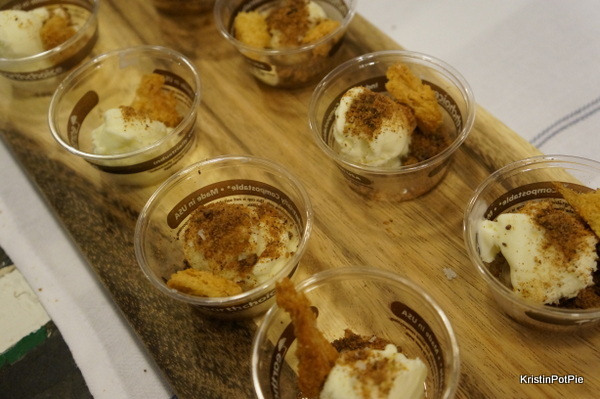 And this olive oil ice cream from Aragona. Very interesting – I loved it! The prettiest dessert of the night and the favorite among my friends, who like their sweets sweet, was this strawberry shortcake from Macrina bakery. But my favorite is always chocolate, and City Catering Company had done it up right with this peanut butter daquoise with devils food cake, peanut feuillantine and dulce de leche. Drinks were aplenty at Sunset Supper as well. 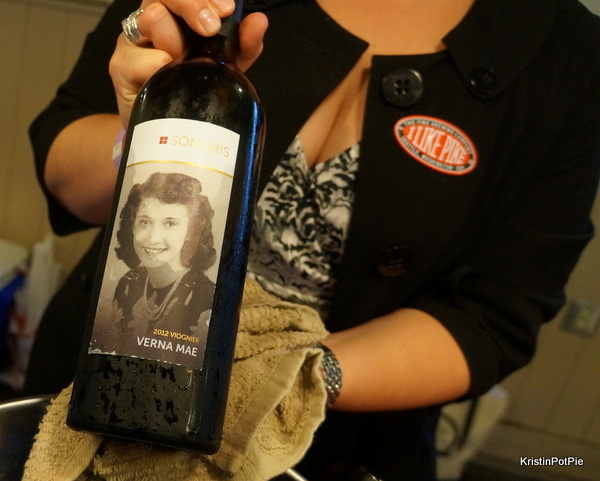 We tried this lovely Verna Mae Viognier from Sonoris Wines. 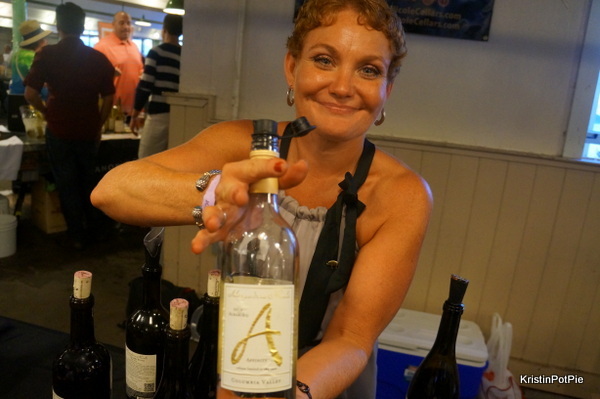 And some rose from Alexandria Nicole winery – they also make one of my favorite Washington reds – the Jet Black! 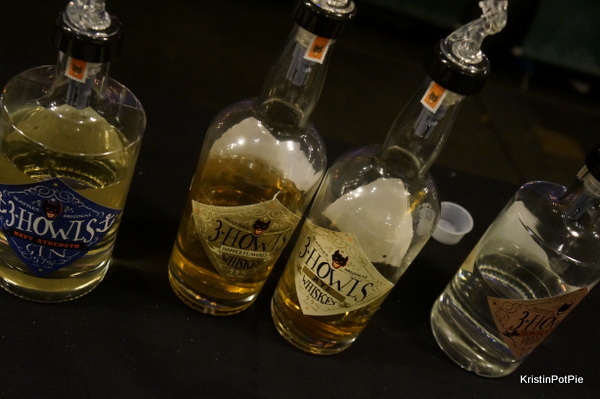 3 Howls Distillery was also on hand trying out samples of their fantastic spirits – I’m not a big shot person but just loved the blood orange vodka! Rachel was all decked out for her big night, and she had every reason to the celebrate! 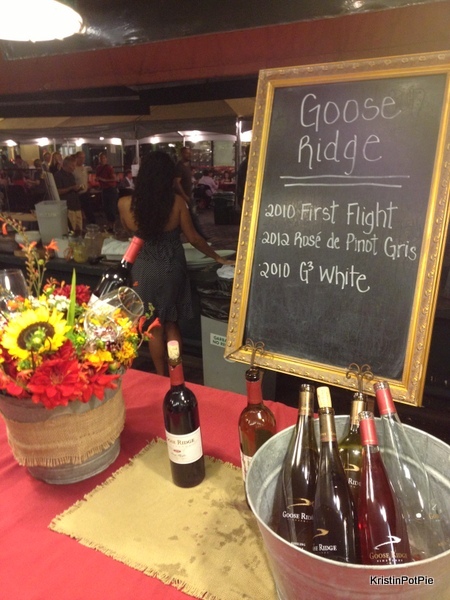 Through Sunset Supper, the Pike Place Market Foundation raised $286,565 for community services in Pike Place Market! Speaking of raising funds for this worthy non-profit, on Sunday, September 28 from 5:00-9:00 PM, Pike Brewing Company will host PIKETOBERFEST— a Fall Harvest Festival featuring beer, wine, spirits, cider, local artisan foods, sausage, and charcuterie. 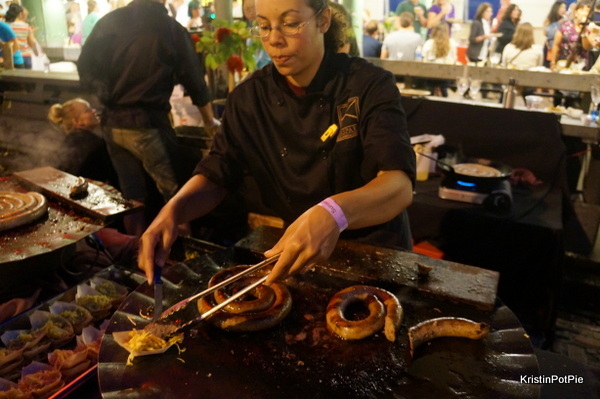 PIKETOBERFEST is a harvest festival featuring local and imported German-style food and drink. It is an opportunity to compare local craft beers spirits, liqueurs, wines and spirits with their German counterparts. 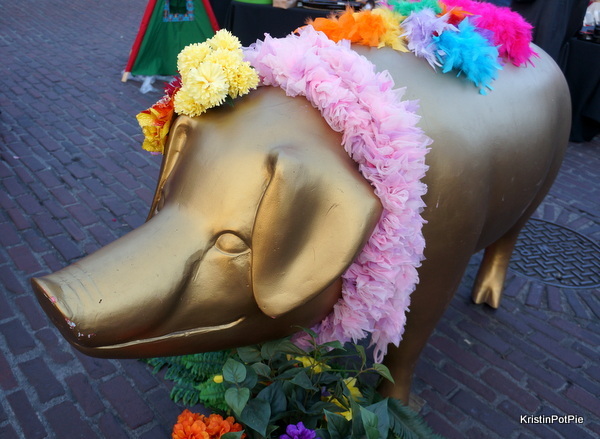 There will be an abundance of extraordinary foods to sample and Pike Brewing Company is teaming up with The Pike Place Market Foundation to make Piketoberfest a benefit to support efforts in providing medical services, low-income housing, child care, and other social services to people in need. Admission includes: all food, authentic Piketoberfest beer mug, 10 drink tickets, music, and up to $4 of validated parking at Russell Investment Garage. And for those of you who you haven’t had them, let me tell you – FROST doughnuts in Mill Creek are just some of the best around! I am so excited to share with you a very special event that pairs these wonderful doughnuts with one of my favorite bloggers, for a cause that is dear to my heart. Party With A Purpose is a charitable event beneﬁtting Pediatric Cancer Research at Seattle Children’s Hospital. 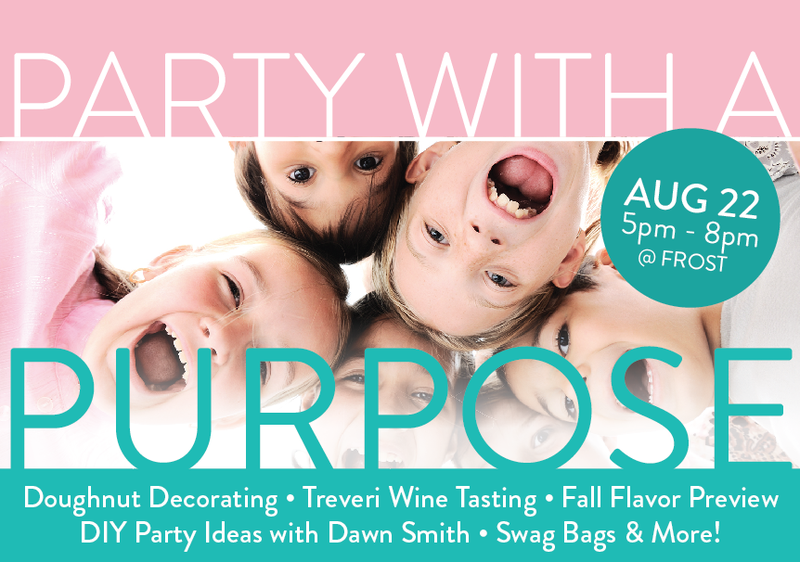 FROST, in collaboration with local lifestyle blogger Dawn Smith, of Not Just A Mommy, will be accepting donations to Seattle Children’s upon entry to FROST on Friday, August 22nd from 5PM to 8PM. For each $5 donation, guests will receive a ticket for a glass of sparkling wine provided by Treveri Cellars; for each $10 donation, guests will receive a wine ticket as well as a swag bag which will be ﬁlled with various gifts provided by our many sponsors. Be sure and stop by early, there is a limited number of swag bags. Enjoy wine and dessert pairings provided by FROST while children decorate their own doughnuts, all while effortlessly giving back to our local community. I just love a good happy hour. Unfortunately many are held, or begin, in the later part of the afternoon when I am still hard at work in the office. 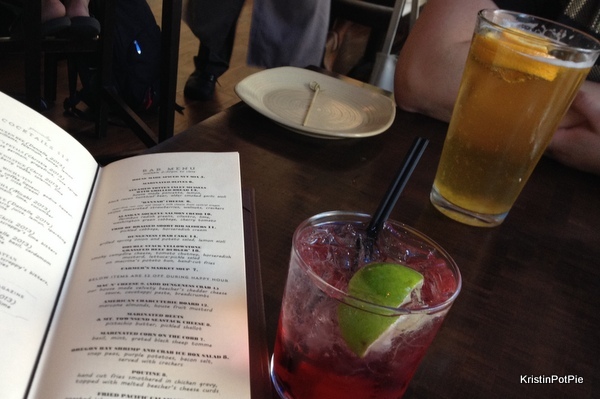 But last weekend, while I was looking for a place nearby the Paramount Theatre for a bit of pre-show noshing, I came upon this fantastic happy hour at Urbane. Urbane serves Northwest cuisine in a relaxed and comfortable neighborhood- style setting and utilizes resources and regional farmers across Washington that are dedicated to sustainable growing techniques. 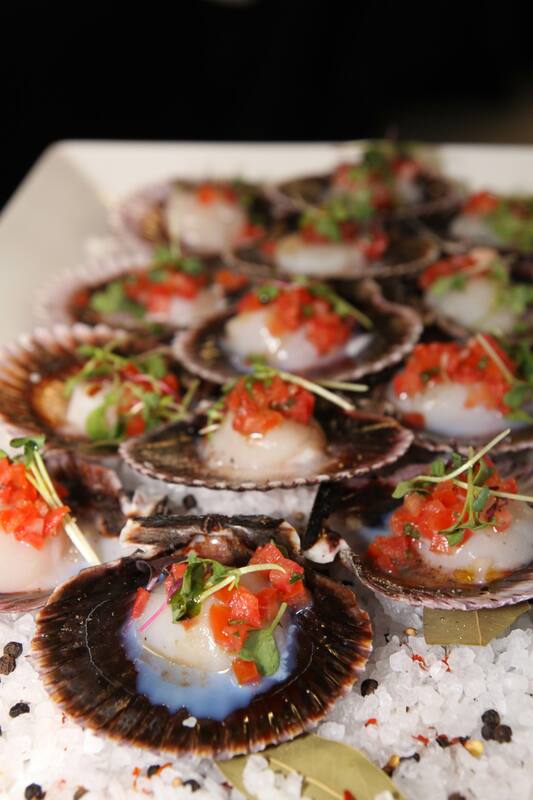 This ensures the use of only the freshest, seasonal ingredients at their peak of quality. 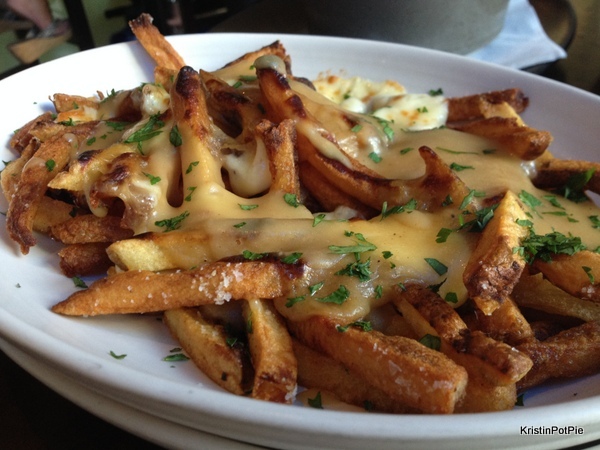 Urbane’s happy hour is held Monday thru Saturday from 4pm to 7pm, and also from 10 to close. But the best thing is that they have a happy hour every Sunday that runs from 2:30pm – close! The regular bar menu, already low priced, is paired with a happy hour menu that features two dollars off a selection of appetizers, and specials on wine, beer, well drinks and martinis all priced ranging from $4 – $7. 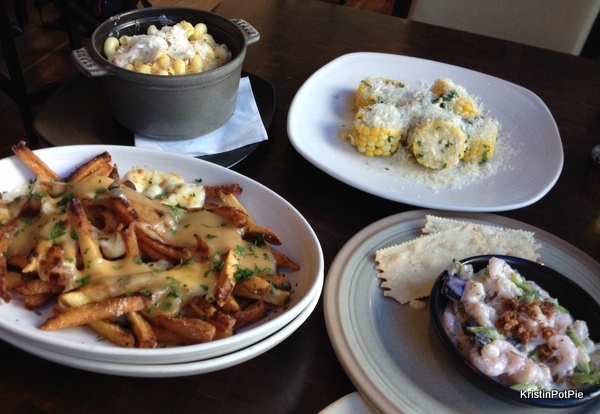 My favorite thing to do at happy hour is order several small plates and share. 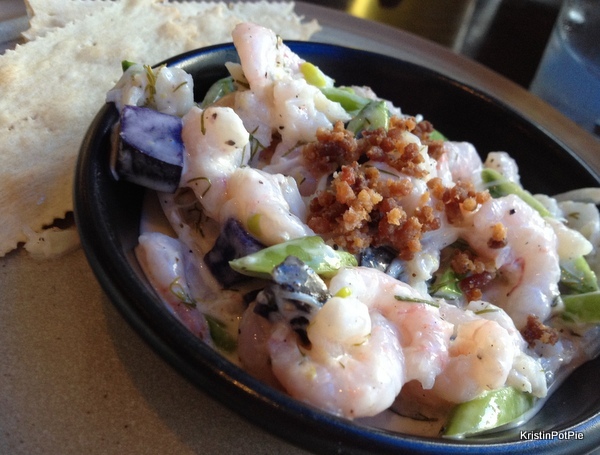 So we decided to try the refreshing Oregon Bay Shrimp and Crab Ice Box Salad made up of fresh snap peas, purple potatoes, dill and bacon, served with lightly salted crackers. 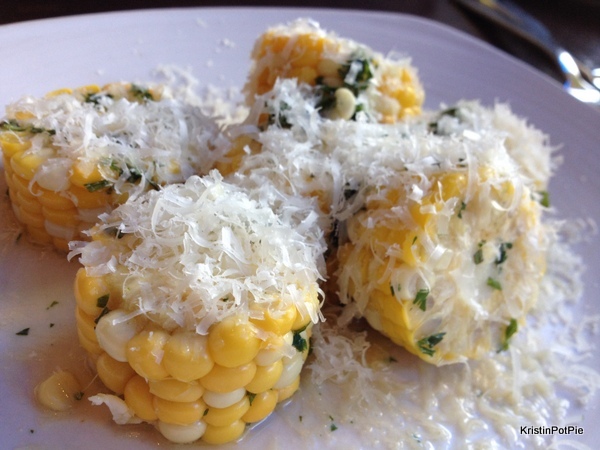 And the chilled Marinated Corn on the Cob topped with black sheep tomme. 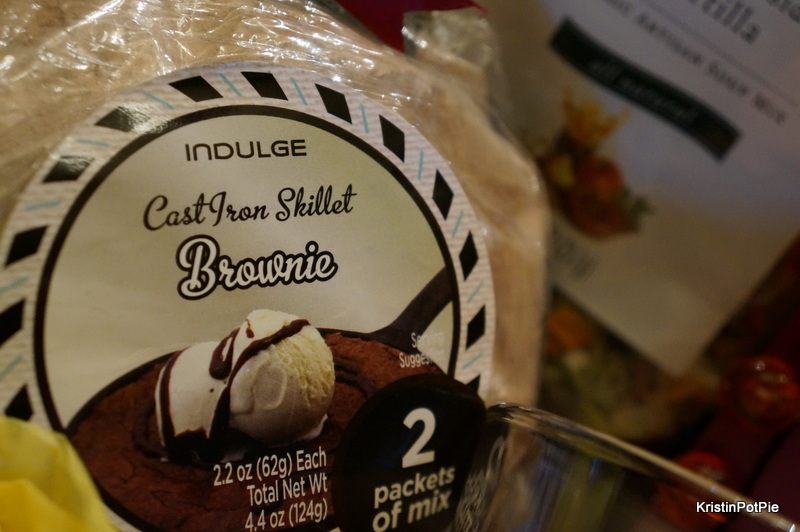 This was delightfully different and the perfect summer time snack! 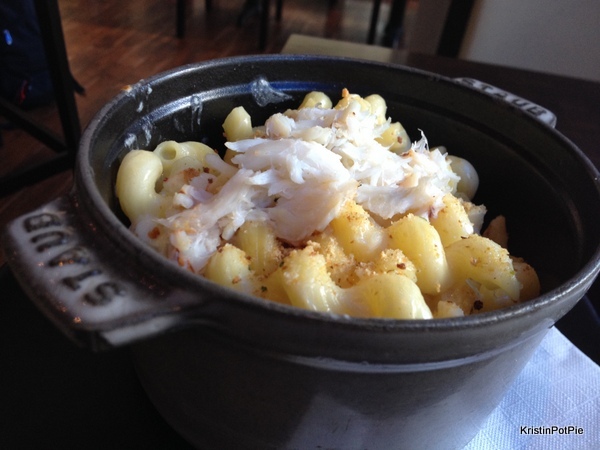 Then we indulged in the Mac n’ Cheese (of course we had it with the added dungeness crab for $4.) SO decadent with house made, velvety Beecher’s cheddar cheese sauce, cavatappi pasta and breadcrumbs. But the Poutine, made with hand cut fries smothered in chicken gravy and topped with melted cheese curds, put me over the moon! 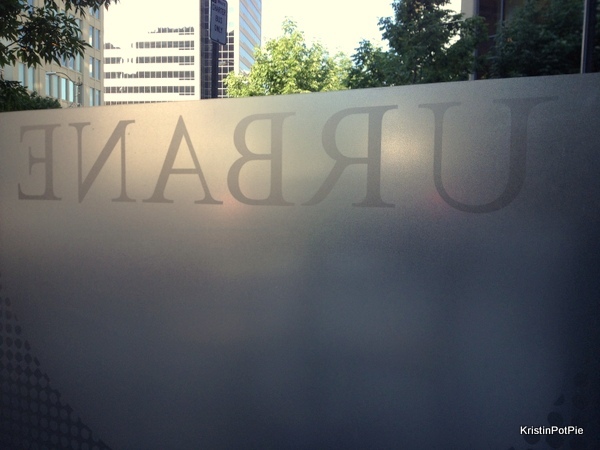 You can try out Urbane for yourself this upcoming week at one of the hottest parties of the summer – they will be one of the featured vendors highlighted at the Pike Place Market’s Sunset Supper next Friday. I cannot wait to see what they have in store for us! I do hope you will join me for this fun and festive event, but hurry! Tickets are going fast! Patron Tickets: Individuals, $250 (Table of 10, $2,500) – 7 pm early admission, canopied seating, exclusive wine service, free parking, and more. FareStart, founded in 1992, is a local non-profit organization that transforms the lives of homeless and disadvantaged individuals by helping them achieve self-sufficiency through life skills, job training and employment in the food service industry. Students enrolled in FareStart’s Adult Culinary program receive not only hands-on culinary training in FareStart’s kitchens, but life-skills classes, counseling, and assistance with housing, food, clothing and other support services to assist them as they change their lives. 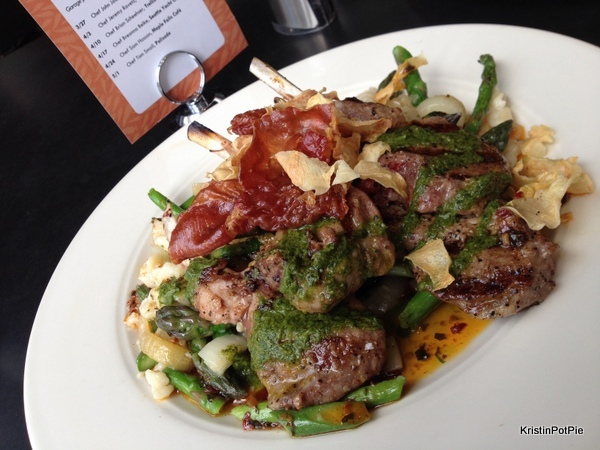 I recently had lunch at The FareStart Restaurant, located at 7th & Virginia in downtown Seattle, which is open for lunch Monday through Friday from 11 a.m. to 2 p.m., and learned more about the many great things that this organization does. 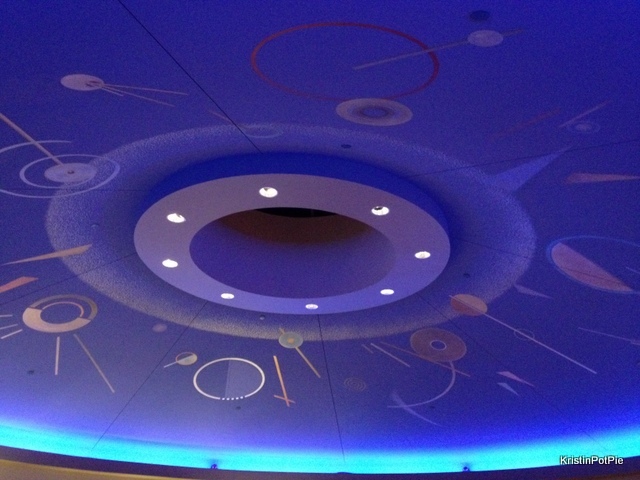 In addition to the weekday lunch, they also host a weekly Guest Chef Night dinner on Thursdays from 5:30 to 8 p.m. Since its inception, FareStart has become a beloved Seattle institution with talented chefs from the area’s best restaurants donating their precious time, expertise, and ingredients to help train FareStart students. Each week, FareStart’s Guest Chef Night highlights this important partnership as a generous local chef donates their time to work alongside FareStart students to prepare a delicious three-course pre-fixe dinner for the public at the FareStart Restaurant in downtown Seattle. 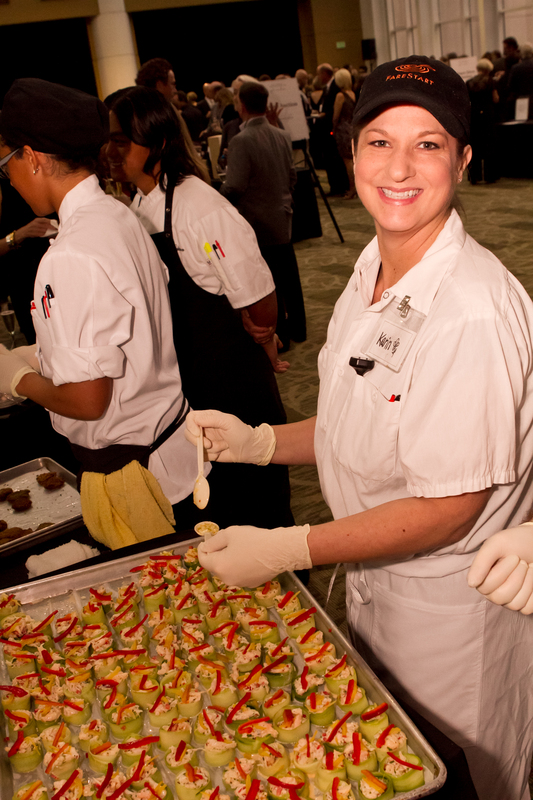 Since 1994, Guest Chef Night has helped raise more than $5 million—all of which has directly supported FareStart’s training programs. 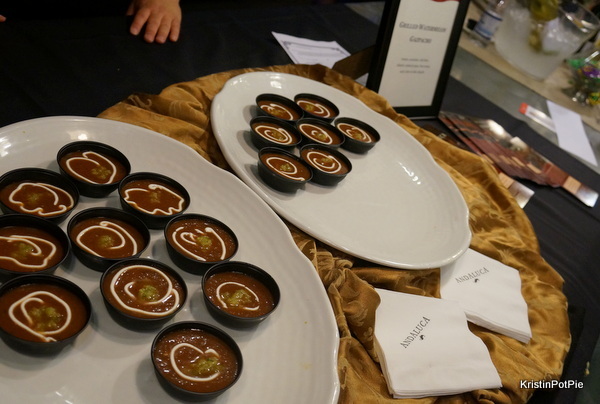 Next month FareStart is hosting a premier tasting event to celebrate the talented chefs, restaurants and other food industry partners that support FareStart’s training programs throughout the year. 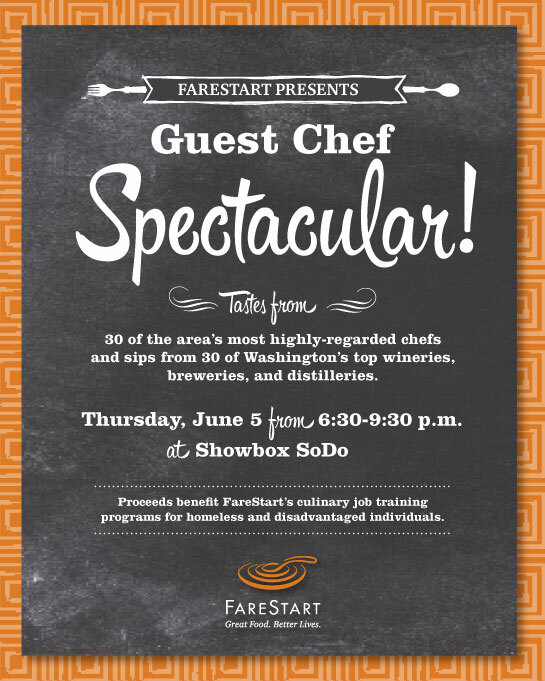 FareStart’s Guest Chef Spectacular will take place Thursday, Jun 5, 2014 from 6:30 to 9:30 p.m. at Showbox SoDo (1700 1st Avenue S., Seattle) and will collectively include tastes from more than 60 of the area’s top restaurants, wineries, breweries and distilleries. 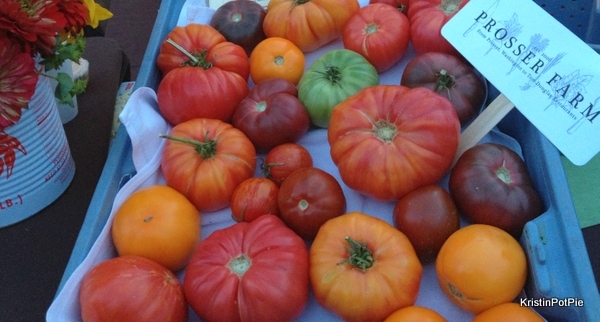 Proceeds from the event will benefit FareStart’s programs. 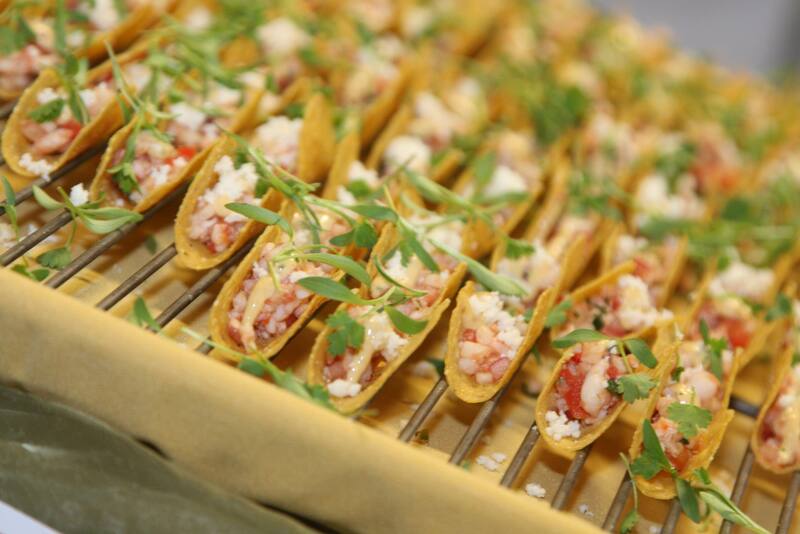 Click here to see the expansive list of visiting chefs, eateries and beverage providers that will be in attendance. Tickets: Tickets for general admission are $80 per person. 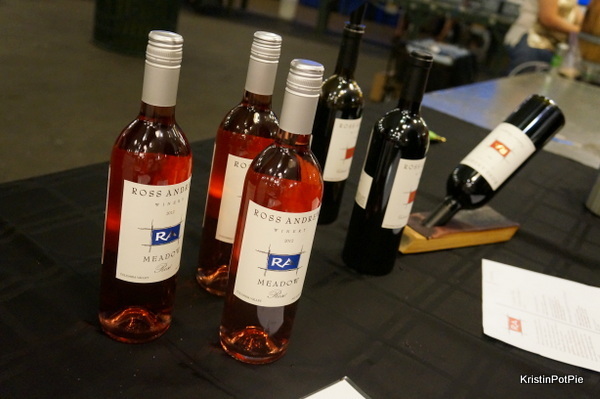 VIP tickets are also available for $130 per person and include access to a VIP Lounge at 5:30 p.m. for special pre-reception featuring exclusive tastes, premium wines, early admittance to the main tasting event, and a special gift bag filled with goodies. This is a 21-and-over event. Tickets will not be available at the door so get them now before they sell out! 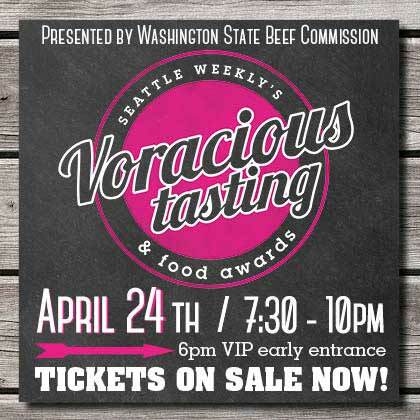 The word “Voracious” is defined as: “wanting or devouring great quantities of food.” Such a perfect name for Seattle Weekly’s column highlighting Seattle’s “food, booze and restaurant news”. 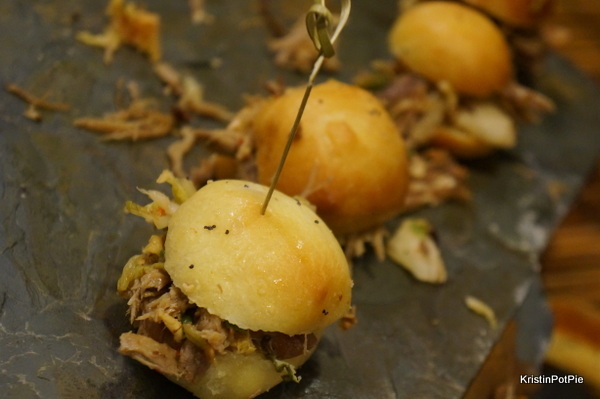 And, an event called “Voracious Tasting”! What a fitting event for a food lover like me. I cannot wait to devour all the deliciousness that will ensue next Thursday night. I hope to see you there – but buy your tickets soon! This event sells out each year! *VIP ticket holders get exclusive early 6pm access to the Paramount Theatre, private bar in the VIP Lounge and a VIP Swag bag. A portion of the proceeds will be donated to Beef Counts at Food Lifeline and Seattle Theatre Group. Must be 21 or older and provide valid identification at the doors for entry. 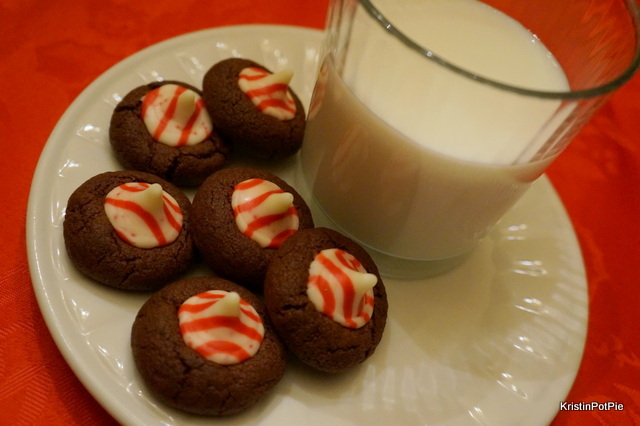 Whether it’s the act of baking cookies with family or friends, or leaving a few out for Santa with a nice glass of milk, cookies and the holidays just go together! For the second year in a row I participated in the Great Food Blogger Cookie Swap hosted by food bloggers, Lindsay from Love & Olive Oil and Julie from The Little Kitchen. This year, with 622 participants, the event raised a total of $13778.40 for Cookies for Kids Cancer, a national non-profit that raises money to fund research to find safer, more effective treatments for pediatric cancer. Thank you so much to this year’s sponsors, OXO, Gold Medal Flour, Dixie Crystals and Grandma’s Molasses. It’s very simple how it works. Participating bloggers make a small donation to the fund and then receive the names and addresses of three other food bloggers across the country. 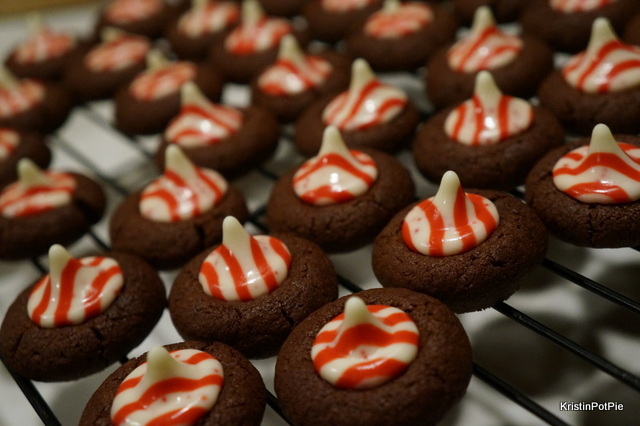 Each blogger bakes and mails three dozen cookies of their choice (one dozen cookies to each recipient) and in turn, also receives one dozen cookies from three other bloggers. 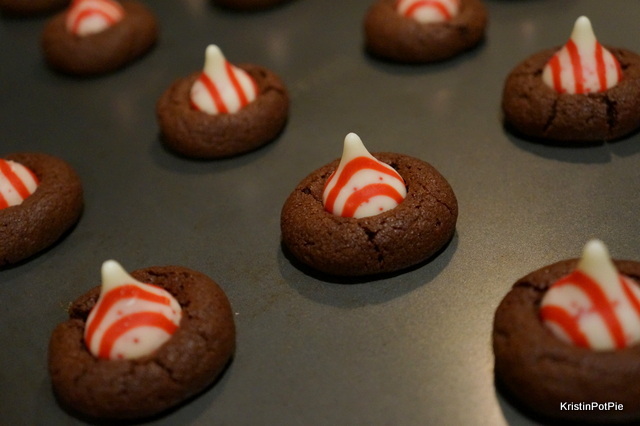 I had been seeing these fun-looking holiday cookies from Better Homes & Gardens (peppermint is a must this time of year!) online since last Christmas, and since I love all things chocolate (last year I made these chocolate and coconut no-bake cookies), I knew it had to be Chocomint Blossoms for my bloggers. Hope you liked the cookies ladies! Honey & Birch (Lavender Vanilla Crescent Cookies) Actually, these haven’t arrived yet. 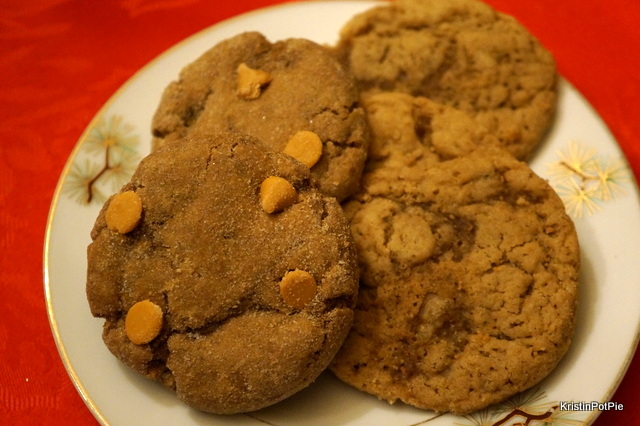 Poor Jenny has sent out two packages of cookies to me that have not made it to my doorstep – they keep getting stuck at the post office just miles away from my house – what’s up with that USPS??? Someone in their sort center is really having a cookie feast! Oh well, I am sure they must have needed them more than me! 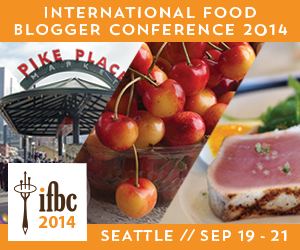 If you are a food blogger and would like to participate next year, go here to sign up for the email list and they will send you information when signups occur. 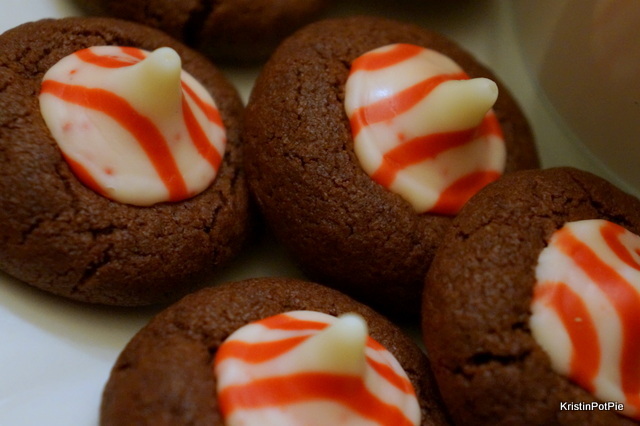 If you would like to support Cookies for Kids, your donation would surely be appreciated – go here for more information. 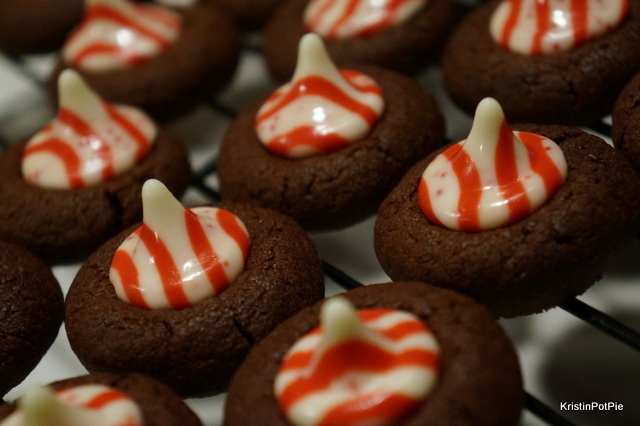 What cookies are you baking up in your kitchen this holiday season? this year we raised a total of $13,778.40 for Cookies for Kids’ Cancer! 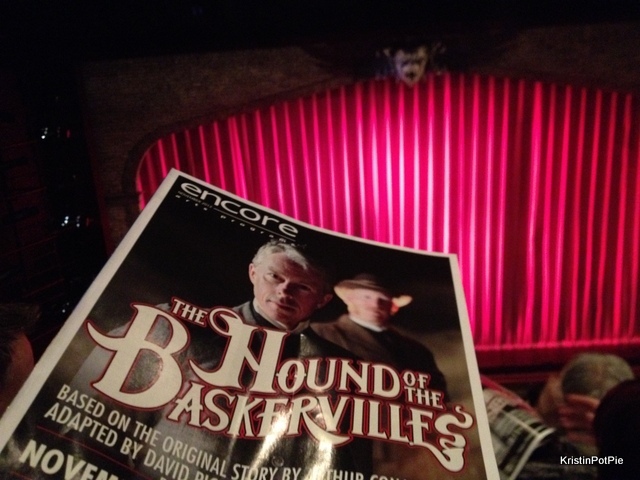 I was recently invited by The Seattle Repertory Theatre for an evening out to see their latest show, The Hound of the Baskervilles. 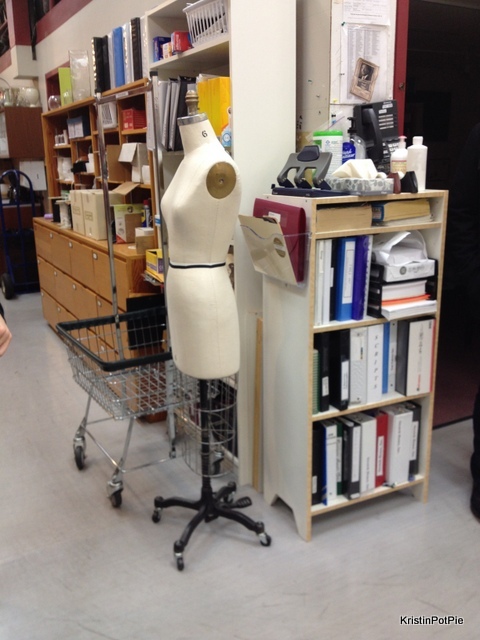 The Seattle Rep was so generous and really spoiled us for the night! 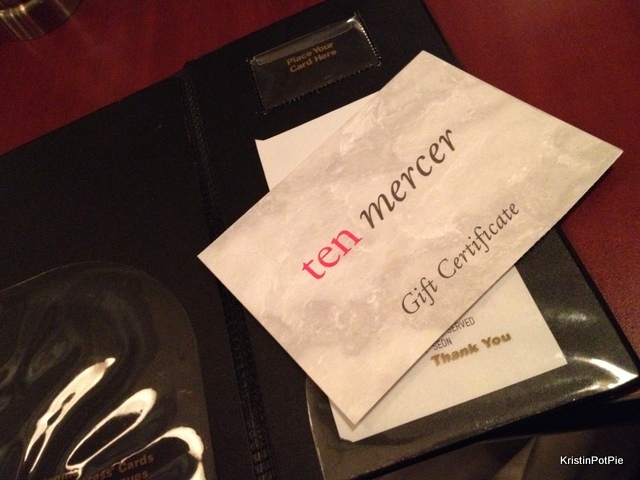 First, we ate like chow “hounds” with dinner at Ten Mercer on them! 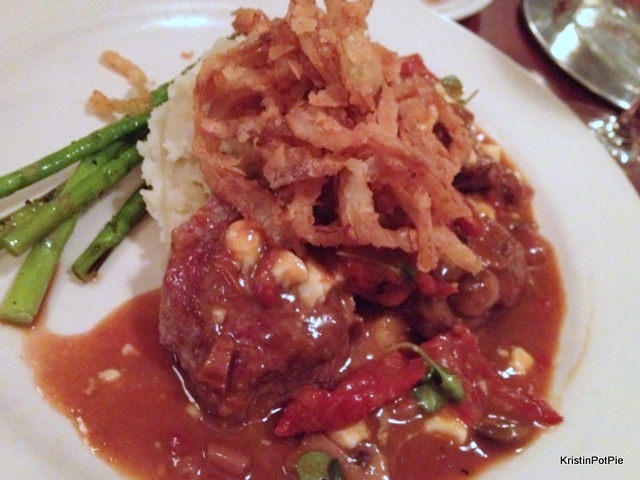 My choice was the Seared Petite Tenderloin Medallions (Creekstone Farms Premium Black Angus Beef) – shoulder tender medallions, wine demi glace, gorgonzola, mushrooms, sun-dried tomato, served over garlic mashers with seasonal vegetable. 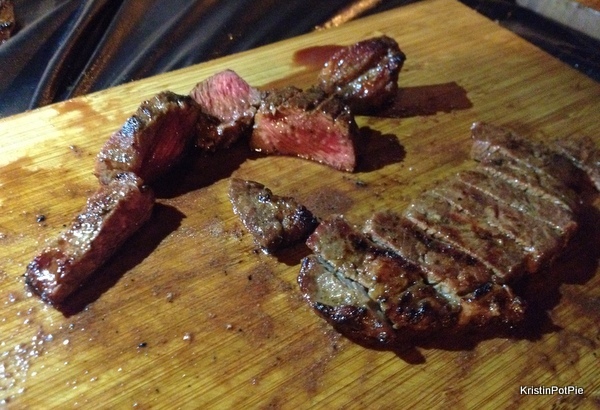 Just look at that perfectly cooked meat – so tender! 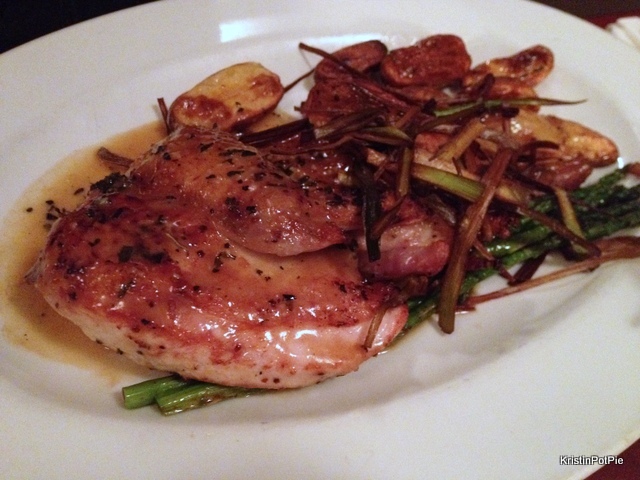 My date (my 13 year old son) enjoyed the Washington Chicken – garlic-crusted pan-roasted Washington chicken, rosemary garlic fingerlings, pan jus. 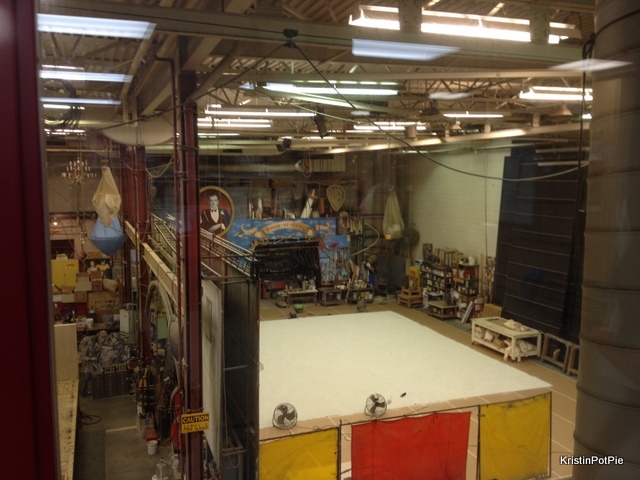 After dinner we headed over to the theatre for a private backstage tour. 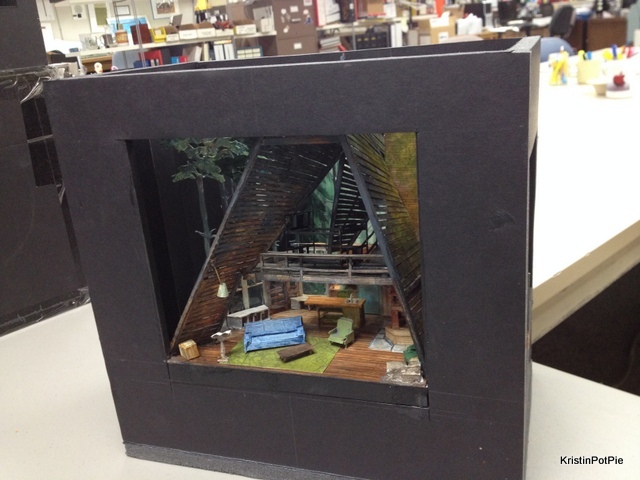 It was fun to see the monster scene shop where they built the incredible set for “Hound”. 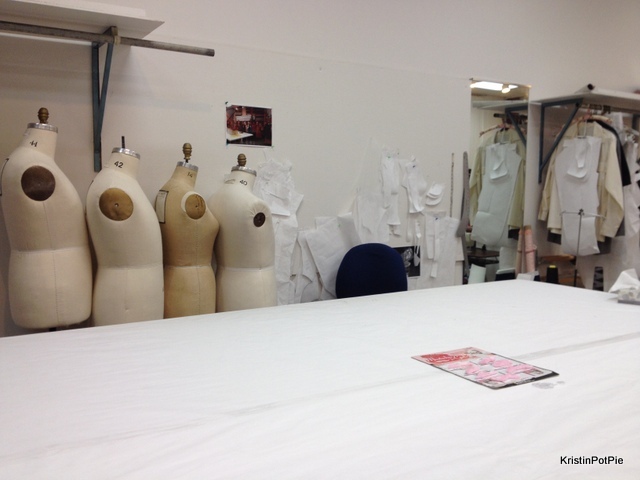 We toured the costume shop where all of the period costumes were made for the show. I studied drama in college and worked in local theatres for several years after that – it was so much fun to be backstage again! 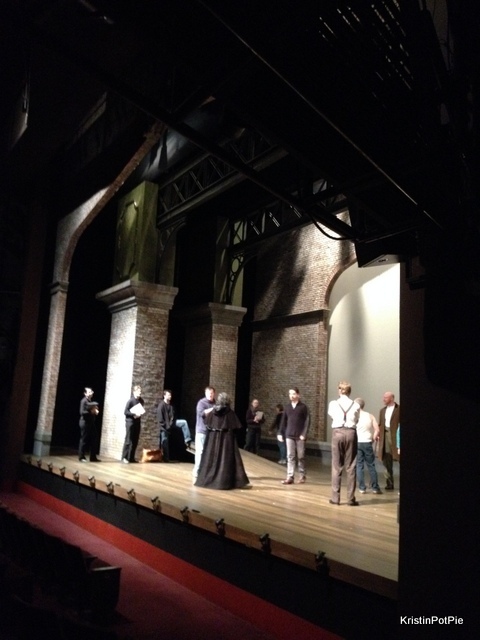 They even let us watch the pre-show fight call – there are quite a few choreographed fight scenes in this show. 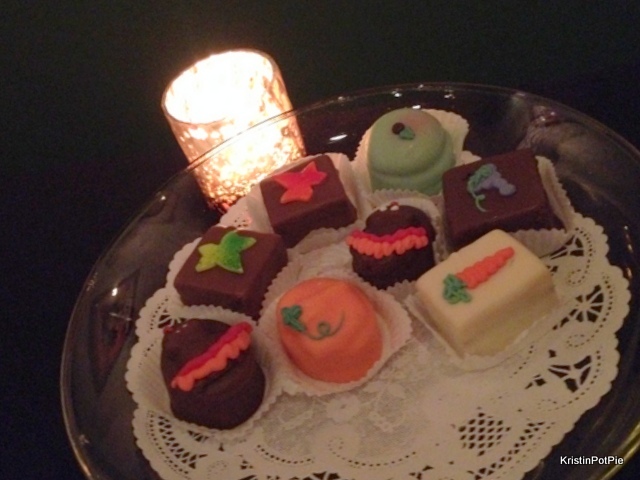 They even hosted a private little reception for us at intermission with drinks and these sweet little desserts. What hospitality! I felt so pampered! Brash Canadian Henry Baskerville has inherited a British manor…and a mystery. Strange things are happening on the moor and someone is trying to kill him. Could it be tied to the legend of a fearsome diabolical hound? This classic Victorian whodunit, based on the original story by Arthur Conan Doyle – adapted by David Pichette and R. Hamilton Wright and directed by Allison Narver, solves the case with the help of the world’s most famous detective, Sherlock Holmes. The show only plays until December 15, so hurry and get your tickets! The limited remaining performances are this Wednesday through Sunday and, trust me, you do not want to miss it! The Seattle Rep is also partnering with the Seattle Humane Society to sponsor a pet food drive during The Hound of the Baskervilles. Bring pet food with you when you go see the show and it will be donated to the Seattle Humane Society’s Pet Food Bank. Donations benefit low-income, sick and elderly pet owners. And for all you dog owners out there – In conjunction with the world premiere adaptation of The Hound of the Baskervilles, the theatre is bringing back Dog’s Night Out! Bring your canine pal to this pooch-friendly special added performance on Sunday, December 15 at 7:30 p.m.Tickets are $25 per dog and $50 per human. How much fun is that? I am just like a big kid when it comes to getting packages in the mail. The best packages of all, though, are ones where you have no idea what is contained inside. 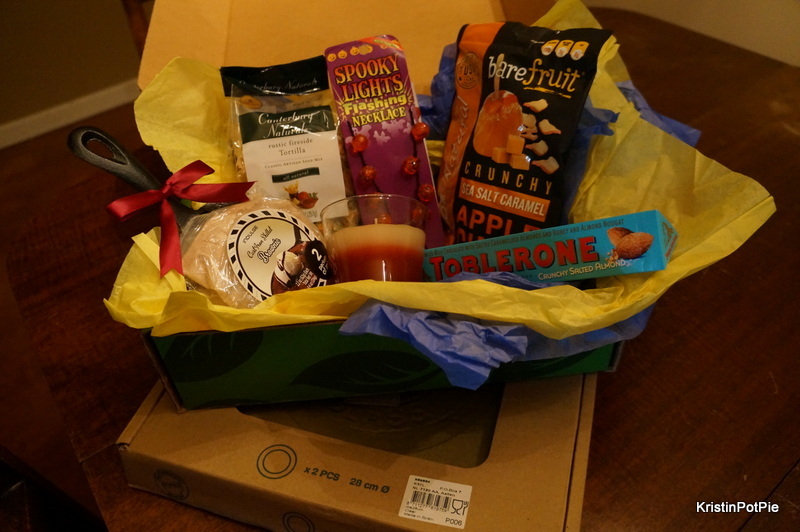 A couple of weeks ago I participated in a fun activity that feeds my love for a good surprise package. 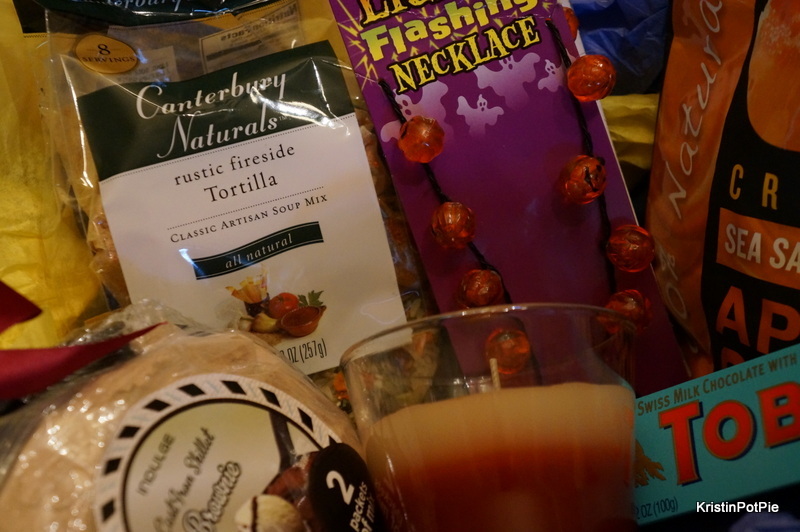 Laura of the blog Bits of Sweetness hosted a box swap! Never heard of a box swap? Well, I hadn’t either! PNWSwaps was actually my first one. Here’s how it works: all you do is sign up, tell a bit about what kinds of things you like and you are matched up randomly with another local person. You then do a bit of shopping, send your package out by the deadline and wait to receive yours. What’s better than getting a package from someone you don’t know? 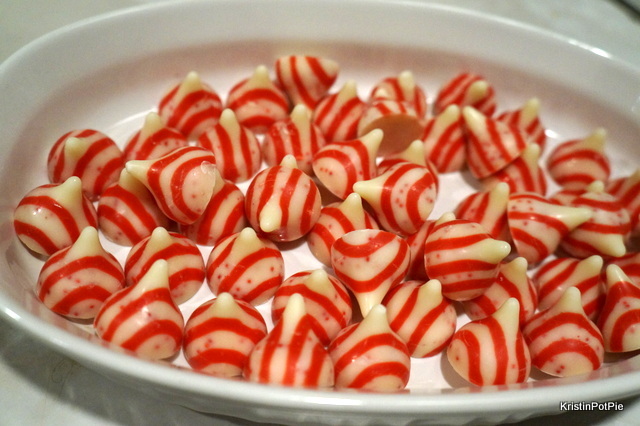 And the surprise of what’s inside makes it all the more delicious. There was a fifteen dollar limit for this one but I really enjoyed hunting for treasures I could find on sale, thrifting and in my very own cupboards. When I got this great package from Kiara of The Buechler Heartbeat I felt like she knew me! The most surprising thing about my package was that it was actually hand delivered! That’s right! 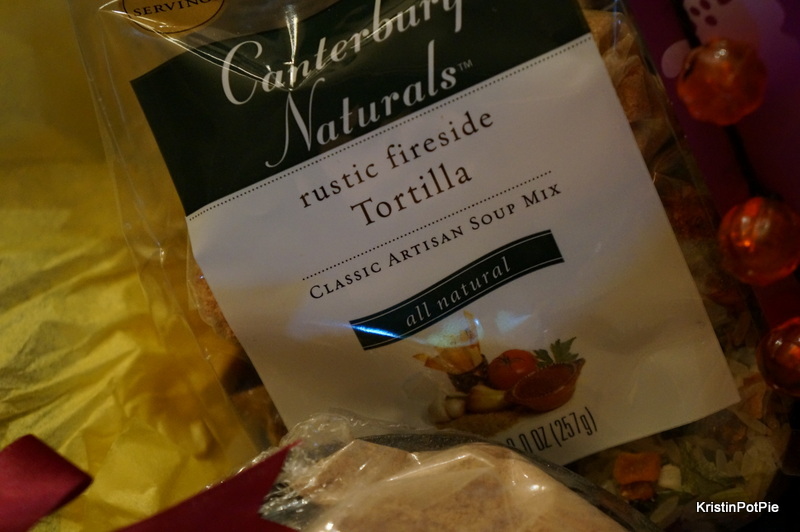 As I sat catching up on some writing, in my Saturday grubbies, there was a knock on my door. 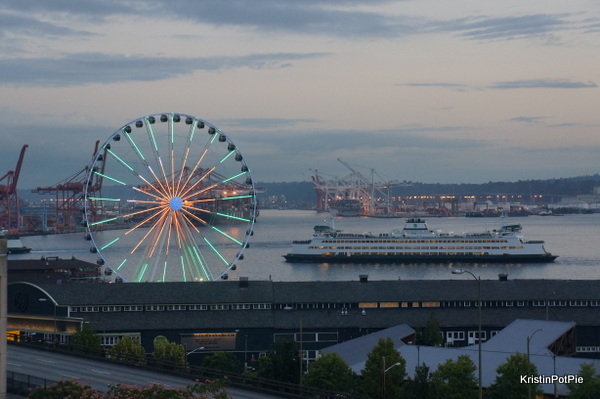 Now, this just doesn’t happen very often here in the Northwest. The only unannounced visitors that we usually get around here are people asking if you believe in the afterlife. 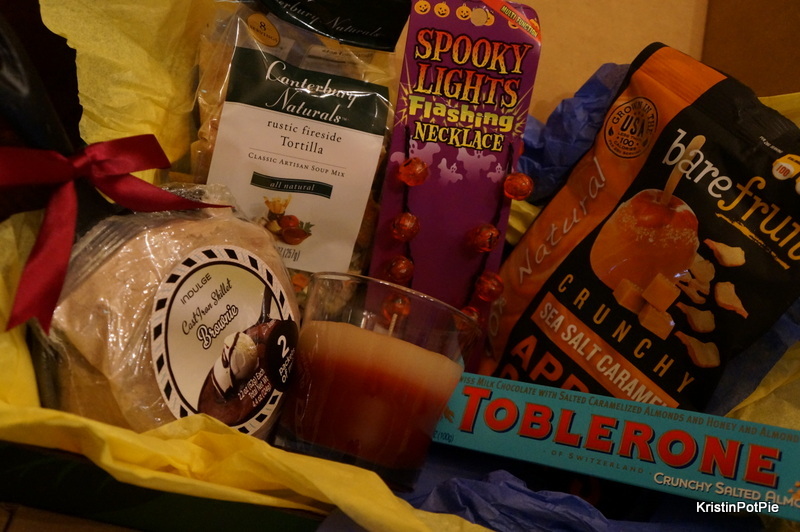 Here’s a closer look at the contents of my lovely box. 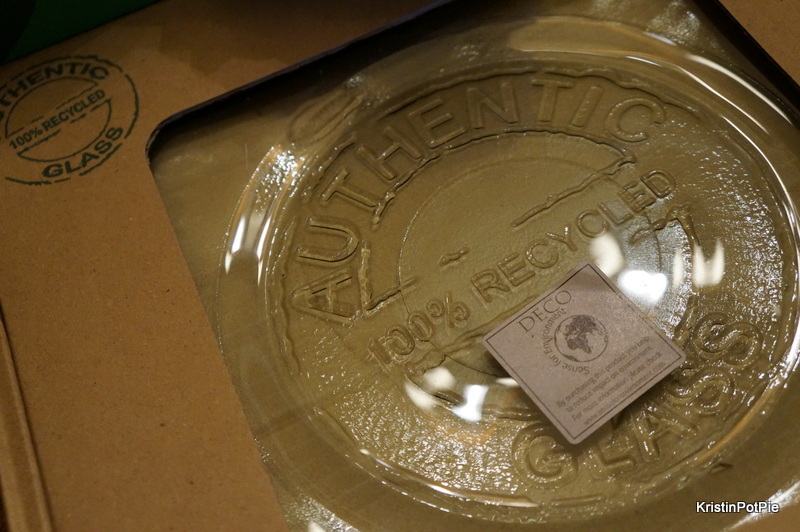 These recycled glass plates are so versatile and will go with any tablescape that I put together! 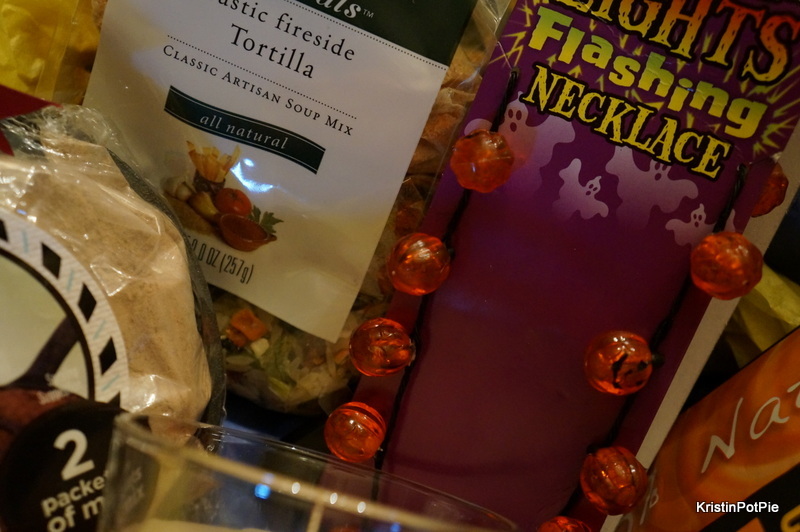 I just love Halloween and cannot wait to wear this fun flashing pumpkin necklace next year! The fall colored candle looks really nice set amongst my autumnal decor. And it smells so amazing! I have a feeling that this will be a good weekend for a big pot of soup – how did you know that soup is my favorite thing to cook? 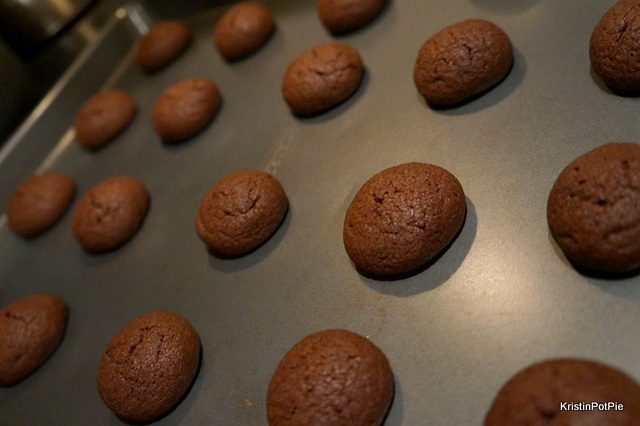 And BROWNIES! Just a big – YES! What a cute little cast iron skillet it comes in. Oh my goodness! 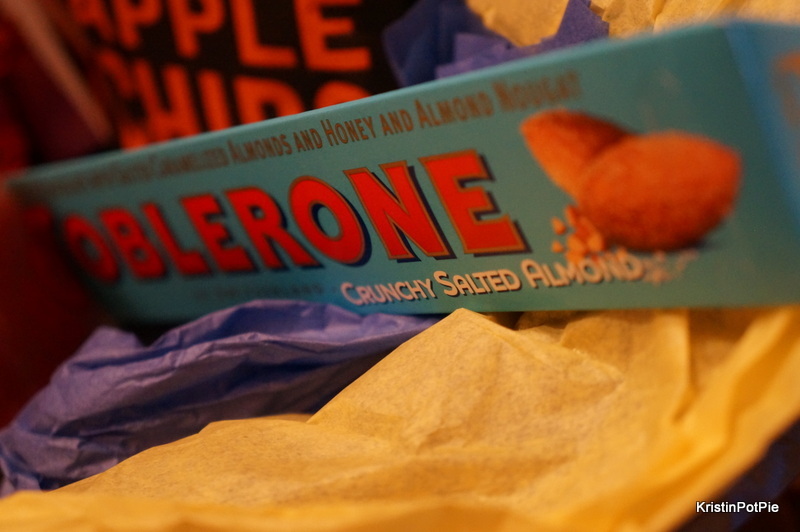 I have never seen a Toblerone like this before! Where have you been all my life? 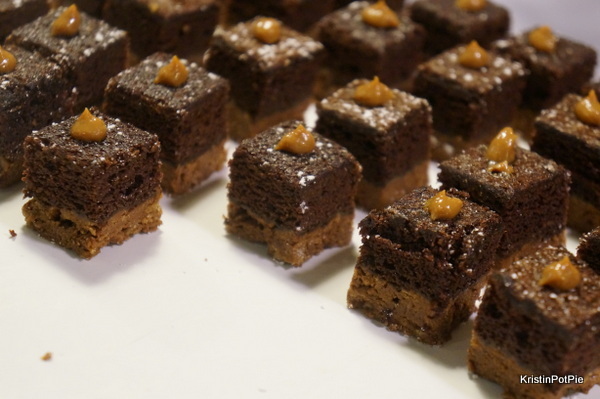 My sweet side is always tempered with a love of the savory and this bar fits the bill! Here is my package off to Holly of Mommies with Cents. She is so sweet! Such a touching email she sent me to thank me. Actually that email, really, was the best part of the whole experience – It’s true. The giving is even better than the getting. 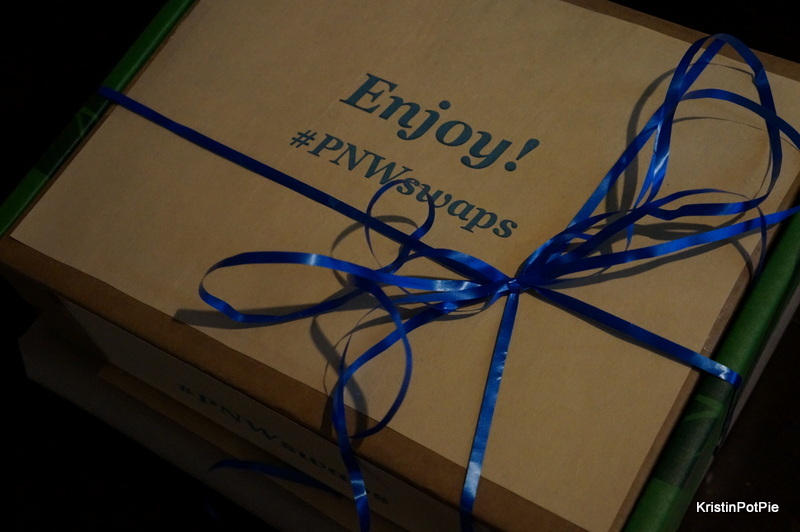 Laura is holding another box swap for us here in the Pacific Northwest just in time for the holidays. I cannot wait to do this again! If you would like to join in the fun (anyone can participate – as long as you are local) in the next box swap, go and sign up now for the Christmas Swap, here. The dollar limit on this one is $20 and the deadline for mailing your package is December 1st – so don’t wait!